Who said Mid Century Modern is not affordable anymore?! 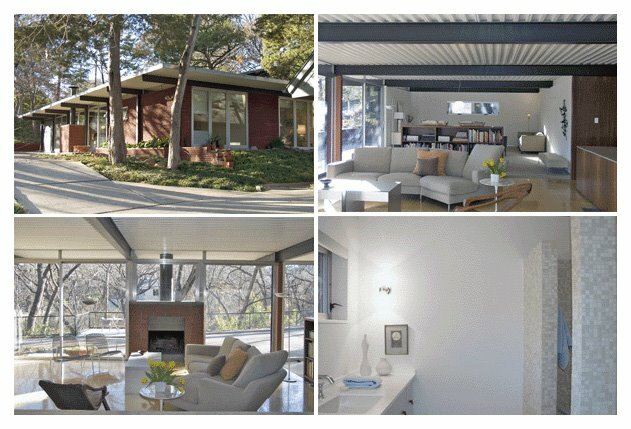 This Mid Century Modern architectural gem is listed at $425000. A unique home and setting nestled at the end of the lane on La Senda. Originally built by a structural engineer, this home features many of the outstanding design features now known as mid-century modern. Driving down a hillside onto the property, there is a motor court between the house and the creek. Floor-to-ceiling glass windows across the front of the living areas look out to tree-covered views. The two living areas measured together are over 40-feet in length divided by a walnut bookcase. The kitchen is completely open into the main living area and both the kitchen and main living feature beautifully preserved original Terrazzo flooring. There is an enormous utility room just to the side of the kitchen with generous storage space and a separate sink. Almost everywhere there is not floor-to-ceiling glass, there are clerestory windows, above which floats the roof. The master bath has been completely updated using marvelous, glass mosaic and Hansgrohe hardware. Both bedrooms have pivot glass door window systems. There is a detached two-car garage and office. The tall roof line for the garage was built with the idea that a second story addition could easily be retrofitted. If mid-century design and a wooded creek setting speak to you, this is a property you do not want to miss.